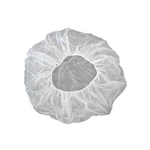 Disposable, lightweight, non-woven bouffant cap hairnets provide supreme comfort and protection. An essential part of any food processing and handling site, pharmaceutical and manufacturing. These caps are breathable, comfortable, disposable, latex-free, provide full hair coverage and a secure fit, and are fully compliant with FDA regulations. Model BW 2100 - Emerald Professional Protection Products Latex Free Disposable 21" WHITE Bouffant Caps Hairnets - 10 x 100ct.